A peasant girl (984/70.3) and boy (984/70.4) make up this pair of cast spelter figurines finished to imitate bronze. The girl plays a mandolin and has her mouth open as if to sing, while the boy holds a curved horn up to his lips. His left hand is placed firmly on his hip. The girl wears a sleeveless, buttoned bodice over a blouse with full, short sleeves. There are flowers in her hitched-up apron, which she wears over two skirts. A flower pattern decorates the overskirt, which is pulled up at the left side to reveal a full, pleated underskirt. Her stockings are striped while her shoes have low heels and small bows. On the boy’s head sits a brimmed hat with a rounded crown and decorative feather. He wears an unbuttoned, long-sleeved jacket over his shirt with a loose pair of pants. Flat strips, tied off at the side just under his knees, bind the pants around his calves. His outfit is completed by a woolly cape tied over his shoulders and flat-soled leather shoes. Both figures stand on thin, textured rounds which are screwed onto stepped wooden bases and secured with a washer and nut, hidden inside a cavity cut into the centre of each base. Spelter, a zinc alloy commonly made with lead or aluminium, was used as a cheaper alternative to bronze in the nineteenth and early twentieth century. This softer, more brittle metal could be finished to resemble bronze with patinated copper plating, wax, or lacquer. It was also sometimes painted. Spelter was commonly used for statuettes like these. 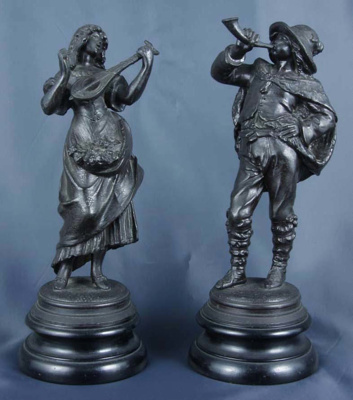 The peasant theme of this pair is typical as were allegorical representations of concepts such as ‘industry’, famous fictional characters such as Don Juan, or characters from Classical mythology such as Muses. This pair came to the Museum from the estate of Emma Newton Jones and may have belonged to a relative before her. She was born in Timaru in 1899 to Alfred John and Florence Nicholson (Scott) Jones, and lived with them until their deaths in 1942 and 1928, respectively. Emma died in 1984, the last, though not the youngest, of eight children, many of whom had departed Timaru to live elsewhere in New Zealand. Alfred was born in Wales around 1863 and immigrated at age four to Fairlie, South Canterbury, later moving to Timaru where in 1885 he married Florence, born 1866. As a long-time member of the local Masonic Lodge, Foresters, Volunteer Fire Brigade, and other groups, he was a prominent community member. He worked most of his career for the Canterbury Farmers’ Co-operative Association.